This candle design features a dolphin. 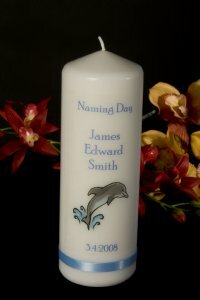 The words Naming Day are at the top of the candle then the dolphin image and then the name of your child and the date of the ceremony. There is a band of blue satin ribbon at the base of the candle. The candle comes packaged in a beautiful organza bag.